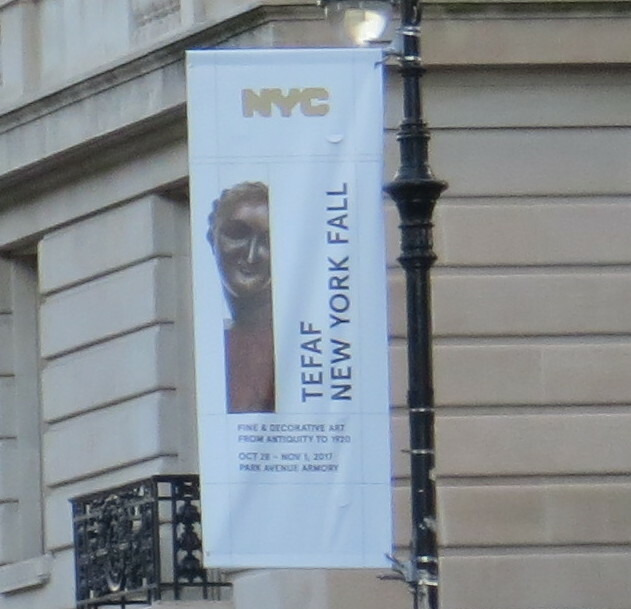 TEFAF, which attracts 75,000 visitors from 60+ countries to its annual art fair in Maastricht, The Netherlands, is using outdoor as one of several media channels to promote its new fair, TEFAF New York Fall, Oct. 28 – Nov. 1. The show organizer has deployed light pole banners in premium locations across NYC, such as the high traffic density intersection at 59th St. & 5th Ave., near the famous Plaza Hotel. While placement is a core value driver here, creative can make a big difference, and there are numerous ways to execute based on marketing strategy, objectives, budget, etc. In order to communicate more content about the fair, TEFAF is using differential creative in which multiple creatives are distributed across the geographic footprint vs. static creative in which every placement is the same. There are numerous ways to execute with differential creative. 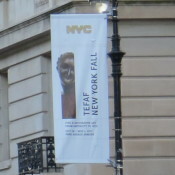 TEFAF chose to change out the creative, specifically the primary image, a key part of their messaging strategy, on one side of its two-sided banners (see full-size photo of their execution). This tactic enables them to communicate more content about the fair than if they ran the same creative on every banner. As you need to keep your messaging short and simple to be effective in outdoor advertising, you are limited in the amount of content you can deliver. Using differential creative is one way to expand the creative canvass so you can highlight more about your event, and increase the potential of your ads to appeal to a wider audience. The show organizer kept the other side of all the banners the same. The consistent marketing message on this side and the common look and feel of the other side (even though images changed) served to tie all of their outdoor ads together. This reinforcement is essential as consumers generally need to see a message multiple times before they act on it. What works best for your show – a static or differential creative strategy – will depend on your specific situation but understand the options available here and factor them into your outdoor media planning.